Welcome to the Radium Elk Park Bed & Breakfast settled in the heart of BC’s Columbia Valley at Radium Hot Springs. Here you can enjoy life taking in serene mountain landscapes of the Purcell Mountains, the Canadian Rockies, reconnecting with nature and experiencing a calmer more peaceful pace. This is the gateway to the beautiful Kootenay National Park, and the Columbia River Wetlands. The Village of Radium Hot Springs is known for Canada's largest mineral hot pools, located in Kootenay National Park, just minutes from Radium Elk Park Bed & Breakfast. Radium Hot Springs is also home for some of Canada's world famous wild life, the big horn sheep, which can be seen in the village and surrounding area throughout the year. Radium Hot Springs is also home to ten spectacular golf courses from Radium Hot Springs to Fairmont Hot Springs all within a 45 minute drive of Radium Elk Park Bed & Breakfast. 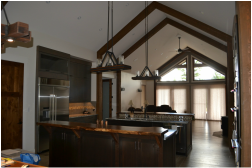 Radium Elk Park Bed & Breakfast is a newly constructed, timber-framed, mountain home located in Radium Hot Springs, British Columbia, at Elk Park Ranch homestead acreages subdivision. Radium Elk Park Bed & Breakfast is located 270 km west of Calgary, the drive usually takes 3 hours depending on how many stops you make traveling through the scenic Banff and Kootenay national parks. 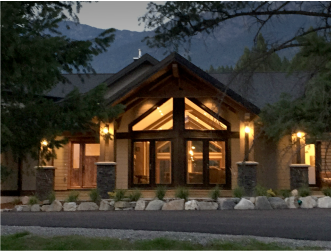 Stay in one of the Radium Elk Park Bed & Breakfast guest rooms or the two bed room, fully contained guest suite and enjoy all the amenities this luxury Columbia Valley mountain residence has to offer. The Elk Room with king bed, private shower, private deck, cable TV. The Big Horn Sheep Room is wheelchair accessible with option of king or split extra long twin beds, private(wheelchair-accessible) shower ,cable TV and private deck. The Columbia Valley Suite is a small condo style unit, two bedrooms each with king beds (or two extra long twins), private showers (one tub), private decks, cable TV, fully equipped kitchen and dining area, with a living room area. Ideal for a family traveling with children or two couples traveling together (breakfast is optional for extra fee with this suite). Breakfast is served in the spacious kitchen/dining area or one of the front or back decks weather permitting. Relax and enjoy the mountain views off the deck of your private guest suite or sit around the outdoor fireplace visiting with other guests in the common areas that Radium Elk Park Bed & Breakfast has to offer. You never know when some of our four legged guests in the area will come by for a visit. Whether it is a male deer with his horns in velvet, mother deer with her fawns, a herd of big horn sheep, squirrel or chipmunk gathering food. We are sure you will enjoy your stay with us at Radium Elk Park Bed & Breakfast. Come and see what we offer and can accommodate. Look here to see where we are and how to get here. Here is our contact information and booking instructions.